The Stabilo Sensor features a micro-cushioning “sensor” technology that is supposed to make long writing sessions more comfortable. The fineliner tip retracts into the metal casing when pressure is applied. For me it feels a bit weird. The pen feels bouncy on the paper and I don’t feel quite as in control as I do with other fineliners. 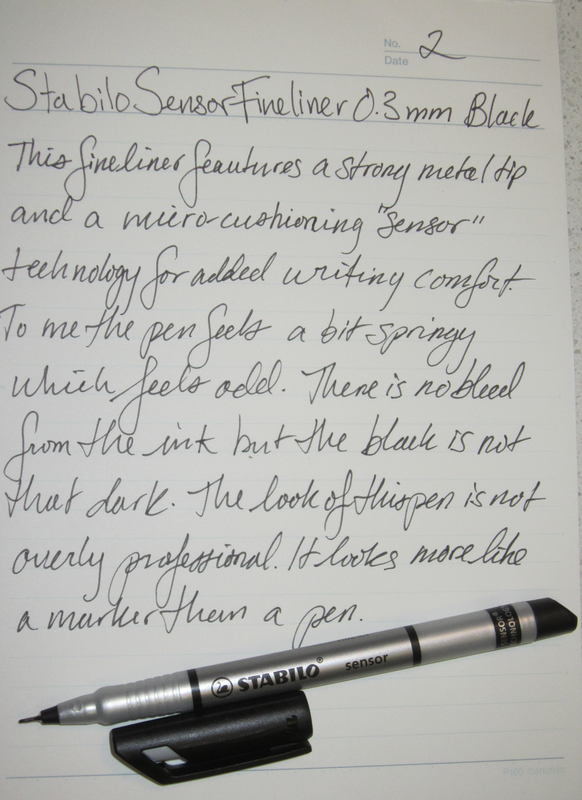 The tip is smooth and glides along the paper nicely. I am not really sure I care for the looks of this pen. The “aluminum look” doesn’t look back but I don’t care for all of the big bold branding; to me it doesn’t have a professional look, it looks like a marker. The Sensor comes in black, blue, red, and green. For $1.60 this isn’t a bad pen but I can’t say I will be rushing out to buy another one.